West Clare during the War of Independence. Two Royal Scots were shot and secretly buried in the campaign. Pádraig Óg Ó Ruairc investigates the disappearance of four British Servicemen in county Clare in 1920-21. As we approach the centenaries of the Easter Rising and War of Independence there is a growing public interest in the period of the Irish Revolution 1913 -1923. To date interest in Clare has focused on relatively well-known events of the period including ambushes, barracks attacks and the deaths of leading rebels. This is unsurprising because these events were commemorated annually from the 1940’s onwards, were frequently discussed by I.R.A. veterans in later life and widely written about in the local press. However one aspect of the conflict in Clare that is far less well-known in the county and nationally is the secret execution and burial of British soldiers and members of the RIC. During the War of Independence four serving members of the British forces; were secretly buried in unmarked graves in Clare. The first British serviceman killed and secretly buried by the IRA in Clare was Private George Robertson. On 21st October 1920 two British soldiers Lance-Corporal Alexander Mc Pearson and Corporal Norman Buchanan had spent the morning drinking in Milltown Malbay in West Clare. Both men were Non Commissioned Officers of the 2nd Battalion Royal Scots (Lothian Regiment) stationed in the area. That evening, on their way back to barracks, they called to the Breffa North district where they began burgling houses on the pretence that they were searching for arms. At 5p.m. that evening they called to the family home of Ned Lynch, Captain of G. Company, 4th Battalion of the I.R.A.’s Mid Clare Brigade. Lynch challenged the pair when they attempted to enter the house. Private George Robertson apparently deserted with another soldier after shooting a 70 year old civilian. They were held by the IRA and Robertson was shot after his companion escaped. Corporal Mc Pherson on 21st October 1920. A short time later Mc Pherson returned with a force of British soldiers, R.I.C. and Black & Tans leading them straight to Lynch’s farm. Upon his return Mc Pherson shot dead Charles Lynch, the seventy year old head of the family. The soldiers were then preparing to shoot Charles Lynch’s son John, and a neighbour, when an R.I.C. Constable named Cooney intervened saving their lives. The British soldiers then set fire to the Lynch family home. Before leaving the area the soldiers shot and wounded John Grady, a local farm labourer, assaulted members of the Lorrie family (several of whom had previously served in the British army) and burned ricks of hay belonging to the Talty, Boland and Moroney families. A week later a group of I.R.A. 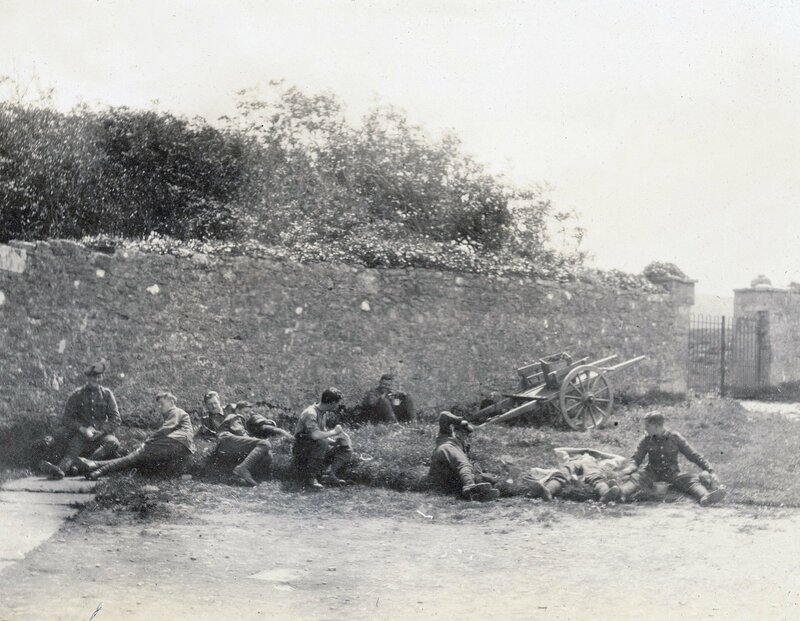 Volunteers led by Mick Meere of Corann, captured Mc Pherson near the village of Connolly – about eight miles east of Milltown Malbay. When captured Mc Pherson was accompanied by a second British soldier, Private George Robertson (service number 3044395.) Both men claimed they were deserters from the British Army. The I.R.A. Volunteers who had captured the soldiers were apparently unaware that Mc Pherson was responsible for Charles Lynch’s death. According to I.R.A. veteran Paddy ‘Con’ Mac Mahon, Mc Pherson and his comrade were initially accepted as genuine deserters and were treated quite well: “never knowing what they were involved in … they kept them in farm houses for some time and they brought them to dances, but there was a guard always with them” Mc Pherson was being held at Mick Eustace’s House in Furroor, Kilmaley when he escaped on the 30th October 1920. According to Ned Lynch Mc Pherson had tricked his guard, an I.R.A. 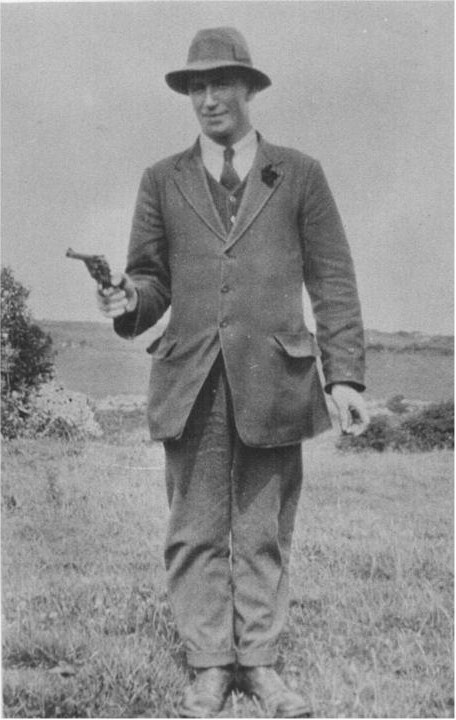 Volunteer named Hehir who according to Lynch Hehir was: “a giant of a man, athletically built but much too innocent for the character with whom he was dealing.” Hehir was loading a revolver under the watchful eye of Mc Pherson who commented Hehir did not have the proper technique for loading the gun. Mc Pherson generously offered to demonstrate this, and when Hehir handed over the loaded weapon, Mc Pherson made his escape without making any attempt to take Robertson with him. The I.R.A. in Connolly panicked when they realised that Mc Pherson had escaped. They feared that he would lead the British forces to the area and capture members of the local IRA Company. In reaction to Mc Pherson’s escape they immediately executed Private Robertson. His body was buried in a bog at Connolly which was owned by Colonel Frederick St. Ledger Tottenham, a local Unionist landlord. Tottenham’s bog was chosen as the site for Robertson’s burial since it was felt that his lands were unlikely to be searched by the British forces. As the I.R.A. had suspected Mc Pherson returned to Connolly the next day leading a British military search party. He identified the houses that he had been held captive in, through marks that he had carved into the furniture with a tobacco knife. At one farm he had carved his initials into the rafters of an outdoor toilet. The houses Mc Pherson identified were searched and burnt in reprisal. Frustrated by their failure to find Private Robertson, British troops killed livestock on nearby farms and assaulted a number of local men. Despite these draconian measures the British Army never found any trace of Private Robertson except for his bloodstained uniform cap. The Eustace family were warned of the advance of the British raiders by a neighbor and were not at home when the British troops arrived. Mick Eustace was arrested by the British forces two days later when he returned to examine the remains of his family home. He was interned in limerick prison until 24 December 1921 before being released without charge. Fr. Gaynor’s account is scarcely credible. Whilst it is plausible that Ned Lynch had demanded vengeance for the death of his father, the statement that Robertson had been left to die – lying undiscovered in the open for a whole day before being bludgeoned to death, seems highly unlikely given that the British army had flooded the area with troops who were scouring the area at that exact time looking for him. Fr. Gaynor insistence that Private Robertson had been “…left lying inside a hedge” does not fit with the fact that Robertson had been buried and hidden so well that the repeated efforts of the British army (and later the Free State army) were never able to locate his body. It is significant that Fr. Gaynor was not in the immediate locality at the time of Private Robertson’s death, and that his version of events was written decades later based on second-hand accounts. Constable Daniel Anthony Murphy, an Irish Black and Tan, was discovered gathering intelligence dressed as an agricultural labourer, shot and secretly buried. Constable Daniel Anthony Murphy was the second member of the British forces killed and secretly buried during the War of Independence. Constable Murphy was captured and executed by the I.R.A.’s East Clare Brigade on the 12th of March 1921. Murphy a Catholic, ex-soldier from Cork had joined the R.I.C. in January 1920 and was stationed in Sixmilebridge. Following the Glenwood Ambush on 20th January 1921 (during which six members of the R.I.C. and Black and Tans had been killed) Murphy began making frequent trips to the district where the ambush had occurred. On these journeys Constable Murphy disguised himself as an agricultural labourer and set about gathering intelligence information for the British forces. The RIC regularly used this tactic to gather intelligence information. For example RIC veteran Hugh McIvor served in a special unit in Bandon, Co. Cork whose members sought out information on the IRA whilst ‘dressed like old farmers’. Murphy was taken to Enagh Wood where he was executed, and his body buried in an unmarked grave. The former National School at Moy. The Moy Company of the IRA had a secret arms dump at the school. Private Chalmers is alleged to have been brought here before being executed and secretly buried in the area. Eight months after Private Robertson’s death a second member of the Royal Scots was executed and secretly buried in west Clare. The I.R.A. 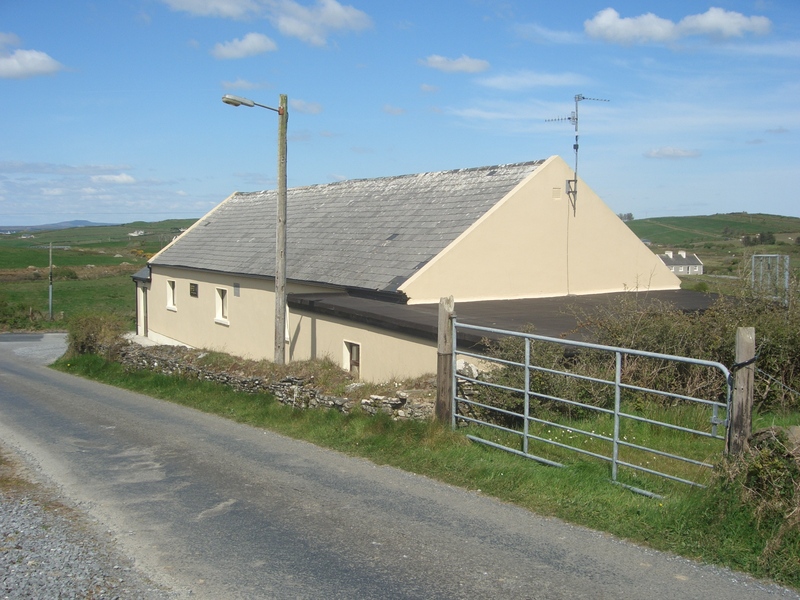 knew that the British forces were due to serve a court summons on Tom Tuttle a republican sympathizer who lived at Moughna, Lahinch. It was expected that the R.I.C. would perform this duty, and a group of sixteen I.R.A. Volunteers had lain in ambush for them on the appointed date but the R.I.C. failed to turn up. The summons was eventually served on the 11th June 1921 by a party of British soldiers from the Royal Scots who had travelled to Moughna in a convoy of four lorries. As they made their return journey one of the soldiers, Private George Duff Chalmers (service number 3044605), deliberately dismounted from one of the lorries in the Lavoureen district. The main party continued on without him. Private Chalmers had been stationed in the area for some time. He was a member of the British army convoy that had been ambushed by the I.R.A. at Monreal on 18th December 1920. Chalmers had been wounded in that attack, and was later awarded £100 in compensation by the British authorities. According to accounts of the incident still surviving in local oral history, Private Chalmers was courting a local woman, and left the convoy to pay her a visit. George Duff Chalmers was captured while trying to visit his local girlfriend and shot as a suspected spy. A short time after leaving the lorry, Chalmers was captured by two members of the I.R.A. Chalmers was brought before a group of local I.R.A. officers including Seamus Hennessy and Stephen Gallagher. During his interrogation Chalmers refused to give his name or any other information. He was subsequently court-martialled by the I.R.A. and sentenced to death. Private Chalmers was taken to the local National School where there was an IRA arms dump, immediately afterwards he was shot and buried in an unmarked grave. The Commonwealth War Graves Commission Memorial to Private R.W. Williams in Bunratty Graveyard. Given Chalmers apparent refusal to reveal his identity to his captors and his membership of the Royal Scots, he may have been mistaken with for Lance-Corporal Mc Pherson, Corporal Buchanan or one of the other soldiers involved in the killing of Charles Lynch. Scottish regiments had a particularly bad reputation in the area. In April 1920 a mixed patrol of R.I.C. and British soldiers from the Royal Highland Light Infantry had opened fire on a group of civilians in Milltown Malbay killing three people. That July mourners attending the funeral of I.R.A. 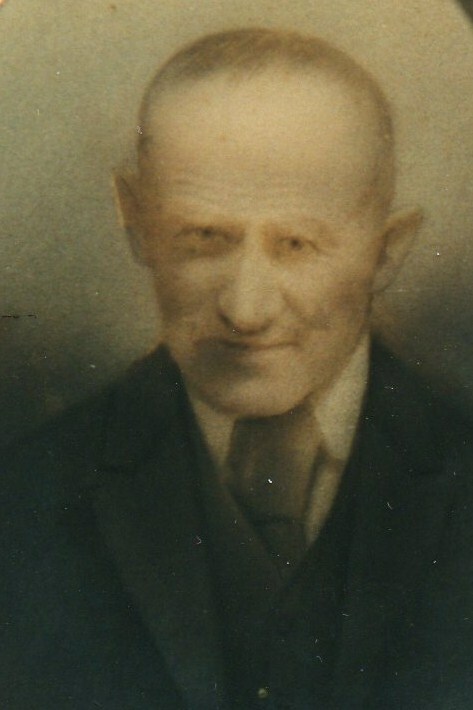 Volunteer Michael Conway in Ennistymon were fired upon by members of the Royal Scots. In September 1920 Scottish soldiers had taken part in the reprisals following the Rineen Ambush which resulted in the deaths of seven people – including two elderly men and two children. If Private Chalmers had been a member of a different British army regiment captured in the same circumstances it is unlikely that he would not have been treated as harshly by the I.R.A. The last British soldier to be secretly buried in Clare was Private R.W. Williams (service number 4179390). Williams, the son of Mrs. M. Williams who lived at No. 3 Abbey Green, Chester was a member of the 2nd Battalion Royal Welch Fusiliers and had been stationed in Limerick. On the 26th May 1921 the I.R.A. had attempted to destroy using explosives the two arched bridge spanning the Owengarry River at Bunratty. The explosion caused a significant breech on the western side of the bridge but did not demolish it completely. The last British soldier to be secretly buried in Clare was Private R.W. 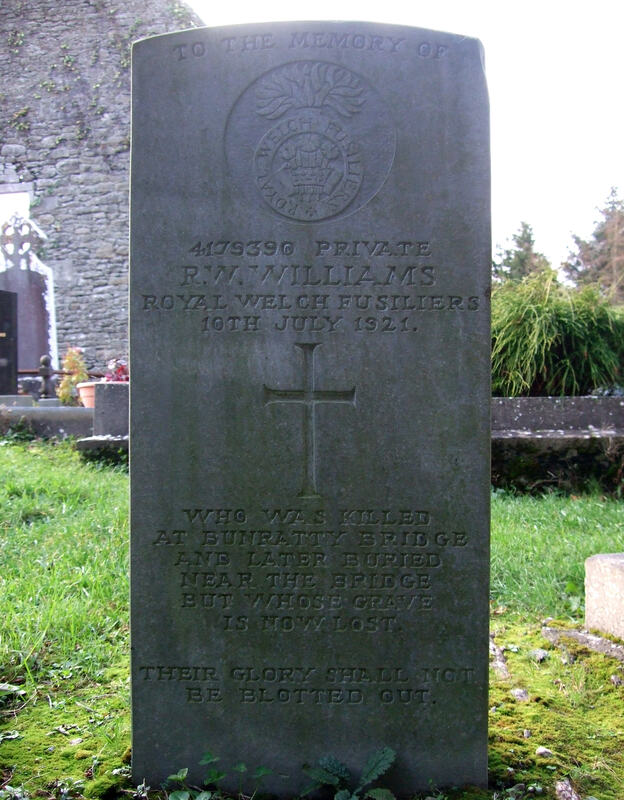 Williams, who was killed in a motorcycle crash at Bunratty and buried by locals for fear of British reprisals in the area. At 2pm. on Sunday the 10th July 1921 two British Army motorcycle dispatch riders approached the bridge from the Limerick direction. Despite the attempts of local people to warn them of the breach, both soldiers plunged into the river below. Private Williams split his head open on the masonry as he fell and had lost consciousness by the time he reached the water. The second soldier managed to save himself but Williams was seen by a local publican, Mrs Ryan, and her daughter, to go under. A few weeks later Williams’ body was washed ashore on the eastern bank of the river about two hundred yards north of Bunratty Bridge. William’s body was discovered by a local farmer who had also witnessed the fatality. The farmer dragged the body from the river and buried him nearby in marshy ground. Attempts to retrieve the bodies. During the Civil War an attempt was made to recover Private William’s body, but despite receiving assistance from the farmer who had buried Williams’ the attempt to retrieve his remains also proved unsuccessful. Free State soldiers spent several days excavating the eastern bank of the Owengarry River at the spot where the farmer had buried Williams’ body. The army officers and medical doctor involved concluded that Williams’ remains had sunk too deep into the river bank to be recovered. During the Truce the I.R.A returned Constable Murphy’s body to the RIC. Private Williams body could not be found despite the efforts of Free State troops. No moves were made to returns the corpses of Robertson and Chalmers. However no such similar move was ever made to recover the bodies of Private Robertson and Private Chalmers. During the Civil War the Duke of Devonshire began correspondence with Richard Mulcahy in an effort to locate the remains of Robertson, Chalmers and Williams. Since the majority of the IRA in Milltown Malbay and Lahinch had taken the republican side during the Civil War, the Free State Army in Clare were unable to glean much information about the location of the soldiers’ remains. The Free State Army were able to confirm that both Robertson and Chalmers had been executed, and could give the approximate date and location of each execution to the Duke. However they were unable to locate the grave of either soldier and were forced to admit defeat after concluding “…there are a good many bogs in that district the information is not very definite”. The search for their remains was abandoned soon after. The correspondence between the Duke and Mulcahy indicates that Robertson and Chalmers families did not make enquiries or petitions to the British Government concerning the men’s fate. This would not have been unusual at the time, given that the bodies of hundreds of thousands of British soldiers killed in the First World War were never recovered. It was also fairly common for the bodies of Black & Tans and British soldiers killed during the War of Independence to be formally buried in Ireland instead of being returned to Britain for burial. In the 1950’s a group of young men accidentally stumbled across Private Chalmers remains whilst cutting turf at Moy. They had been told that there was a British soldier buried in that part of the bog and warned not to cut turf there but had dismissed this warning as an old wives tale. When they uncovered part of Private Chalmers’ uniform they quickly reburied it and went in search of another area in which to foot turf. The four British servicemen killed and secretly buried in Clare during the Irish War of Independence each died in completely different circumstances. The common element between the four cases is that their remains were deliberately buried in an effort to hide them from the British forces because of the fear that the discovery of their bodies would lead to British reprisals. Occasionally the IRA in Clare had also secretly buried (albeit temporarily) the bodies of their members who had been killed in action, such as Martin Devitt and Thomas Healy, to keep news of their deaths from the British Forces. The only other common factor that could possibly link the four is the possibility that some of them were acting as spies when they were killed. This charge cannot in any way apply to Private Williams since his death was unquestionably the result of an accident. The I.R.A. had officially executed Private Chalmers on the grounds that he was spying at the time of his capture – however the alternative explanation that he was in the area trying to visit a girl he was courting seems more plausible. This is supported by Chalmers’ failure to offer an explanation of his activities to his IRA captors. British soldiers captured by the I.R.A. whilst acting as spies usually had prepared a cover story claiming that they were innocent civilians mistaken for soldiers, or more commonly, claimed that they had recently deserted from the British army. Chalmers does not appear to have concocted any such ‘cover story’ and when interrogated by the I.R.A. simply refused to answer their questions. There can be no doubt that Constable Murphy was acting as a spy when he was captured and executed by the I.R.A.’s East Clare Brigade given that he was travelling through the countryside making inquiries about local republicans whilst adopting the guise of a farm labourer. When Lance-Corporal Mc Phearson and Private Robertson were captured by the I.R.A. they had initially claimed to be deserters from the British army. Mc Phearson’s actions in marking, for later identification, the republican safe houses that he had been held in, and his efforts to lead British troops on a search of the Connolly area afterwards suggest that he was definitely gathering intelligence about the local I.R.A. Whether Mc Phearson had deliberately set out on this mission, or whether it was a spur of the moment decision he adopted once he thought of returning to his battalion will probably never be known for certain. Nor will we ever know for sure whether Private Robertson had willingly embarked on an intelligence gathering mission with Mc Phearson, or whether he was a genuine deserter who was very unfortunate in his choice of companion. Pádraig Óg Ó Ruairc, Blood On The Banner – The Republican Struggle in Clare (Cork 2009). Fergal D’Arcy, Remembering the War Dead (Dublin 2008). Irish Military Archives A/07304 (Correspondence relating to British soldiers missing in Ireland 1919-1923). Pádraig Óg Ó Ruairc is a PhD student at the University of Limerick. He has published a number of books and articles on the War of Independence & Civil War in Clare and Limerick. His most recent book “Revolution – A Photograph History of Revolutionary Ireland 1913 -1923” was short listed for the Best Irish Published Book category in the 2011 Irish Book Awards. Burning of Eustace’s House in Furroor in Kilmaley Parish Magazine (Clare 1989), p. 64. Eamonn Lynch, Bureau of Military History Witness Statement Thomas Hehir later married Mick Eustace’s daughter Margaret. See: Burning of Eustace’s House in Furroor in Kilmaley Parish Magazine (Clare 1989), p. 64. Written by: PadraigOgORuairc on 7 February, 2013. Last revised by: John_Dorney26 March, 2013. 5 Responses to "Missing In Action – British Servicemen Secretly Buried In Clare During The War of Independence"
Very well researched and very interesting. It says something about the era that the families didn’t inquire about the return of the bodies. It’s hard to imagine today, but when hundreds of thousands of men went missing for good just a few years earlier, I suppose it wasn’t that unusual an event. It’s unfortunate McPherson got away, both for leading to the other private’s death, the reprisals, and (not least of all) his escaping of his deserved fate for terrorizing the area. The story of his escape is mind boggling; maybe a year earlier such naivete among an IRA guard might have been somewhat understandable. At this point in the conflict, however, I can’t understand how this could have happened. The parents of Private Chalmers were dead, that’s why no-one went looking for him. It’s a shame that the government has let these men down by not burying them properly.